Tucked away in Fire Farm's library is Better Homes and Gardens Decorating Book, published in 1956. 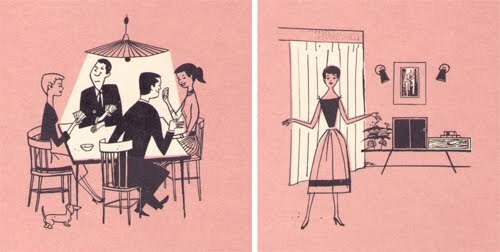 While the book covers all areas of home decorating, our favorite chapter is (can you guess?) Chapter 7: Lighting. Because we found it so delightful (and sometimes insightful), we've decided to post excerpts from it periodically here on our blog. 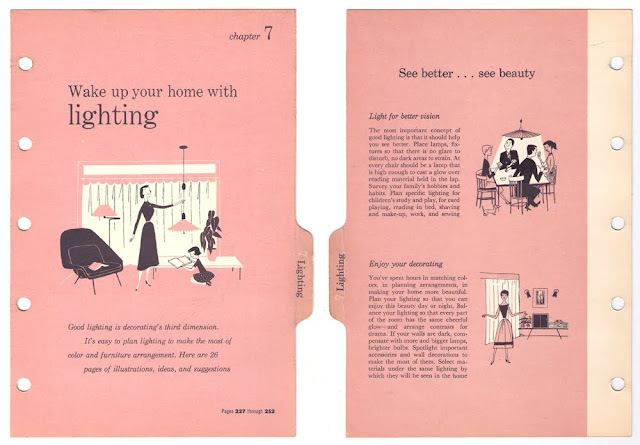 This week's nugget of mid-century widsom is found in the chapter introduction: "Balance your lighting so that every part of the room has the same cheerful glow--and arrange contrasts for drama." "Good lighting is decorating's third dimension. It's easy to plan lighting to make the most of color and furniture arrangement. Here are 26 pages of illustrations, ideas, and suggestions." "The most important concept of good lighting is that it should help you see better. Place lamps, fixtures so that there is no glare to disturb, no dark areas to strain. At every chair should be a lamp that is high enough to cast a glow over reading material held in the lap. Survey your family's hobbies and habits. Plan specific lighting for children's study and play, for card playing, reading in bed, shaving and make-up, work, and sewing. You've spent hours in matching colors, in planning arrangements, in making your home more beautiful. Plan your lighting so that you can enjoy this beauty day or night. Balance your lighting so that every part of the room has the same cheerful glow--and arrange contrasts for drama. If your walls are dark, compensate with more and bigger lamps, brighter bulbs. Spotlight important accessories and wall decorations to make the most of them. Select materials under the same lighting by which they will be seen in the home."